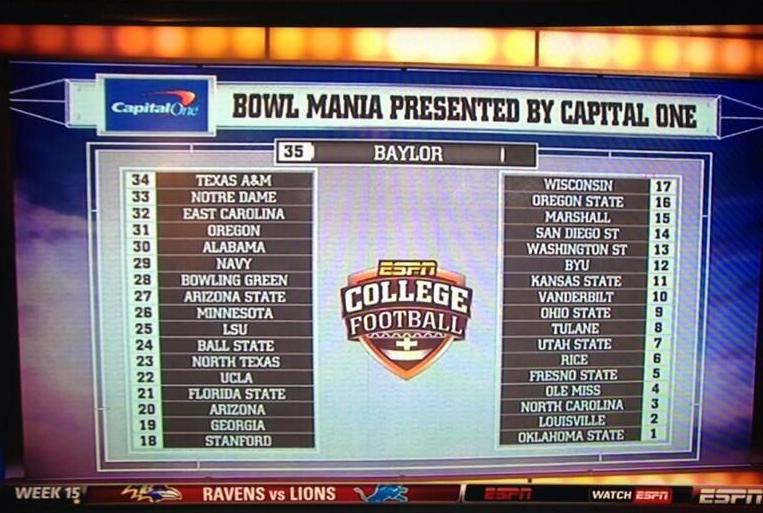 TODD MCSHAY’S BIG BOWL BOARD! Due to popular demand, I present to you Todd McShay’s BIG BOWL BOARD!!!! Week 15 2013: Picks are graded, results are up! Our final week of the regular season was a rough one for our panel of football experts. The slate of games was pretty small, so there weren’t quite as many cupcakes to choose from I guess. Let’s dive right into the good stuff. We only had a few winners this week to speak of. Jennifer will claim a slice of this week’s pie, going 5-2 on the week. Mark May went 4-1 on the week, with his only lossing being Oklahoma State. The two of them will split this week’s win. Other mediocre winning weeks came from Colin Cowherd (3-2), Phil Steele, 4-3), Brian Griese (2-1), and Dari Nowkhah (6-4). Our dueling celebrity guest pickers Joey Chesnut and Ryan Riess both went 4-2, although picking differently. Chesnut went with Ohio State while Riess went with Michigan State, while Stanford got it right with Stanford, while Riess chose Arizona State. Upset specialists had a solid week. Mark Schlabach got his pick right this week with Michigan State over Ohio State. Brad Edwards shocked the world with BGSU over NIU (Phil Steele is the only other expert to take BGSU). Todd McShay jumped on the Mizzou bandwagon, and sadly missed out on the Auburn win. Jennifer nailed another upset special going with Michigan State, but in case you missed it, that means in back to back weeks, her upset special predicted the demise of BOTH THE #1 AND #2 TEAMS IN THE COUNTRY! She will be awarded a golden unicorn star for this feat of sorcery. Before we get to losers this week, I thought I’d mention that Coach Corso went 3-3 on the week but missed his headgear pick (the Buckeyes). Now on to losers. Herbie kicked things off with a 2-4 record this week. Todd McShay posted a 1-3 week. Dr. Lou decided to swing for the fences, and missed by a mile with a 1-3 record. Robert Smith went 2-4 while Brad Edwards went 2-3. However, this week’s undisputed loser was Mel Kiper Jr. who went 1-4 on the week. Sorry pal. Other than that, check out the full slate below to see how your favorite (or most hated) personality did this week.